Jesse Glimp taking off in a 2005 Challenger airplane. FORT SMITH, Ark. - Feb. 18, 2019 - PRLog -- Heart of Hospice demonstrates that quality end-of-life care attends not only to physical needs but also to spiritual and mental needs. Jesse Glimp had three wishes: riding in an airplane, riding on a train, and speaking to youth about the dangers of drug use. Heart of Hospice granted them all. Glimp,32, is on Heart of Hospice services for end-stage Chronic Obstructive Pulmonary Disease (COPD), which developed following his two-year battle with drug addiction. As the disease progressed, Glimp suffered a stroke and was admitted shortly thereafter to Heart of Hospice. Heart of Hospice prides itself on providing quality, individualized, end-of-life care in the communities it serves. Every patient receiving care from Heart of Hospice has a unique, individualized care plan that is developed in collaboration with the interdisciplinary care team, the patient, and the patient's family. During the development of Glimp's care plan, Kimberly Dunigan, Manager of Volunteer Services learned of Glimp's last three wishes. Dunigan shares, "The moment I heard a team member say a patient's last wish was to ride in a plane, I immediately called my father-in-law, who has a 2005 Challenger, and asked him if he was up for taking a patient on the trip of a lifetime." 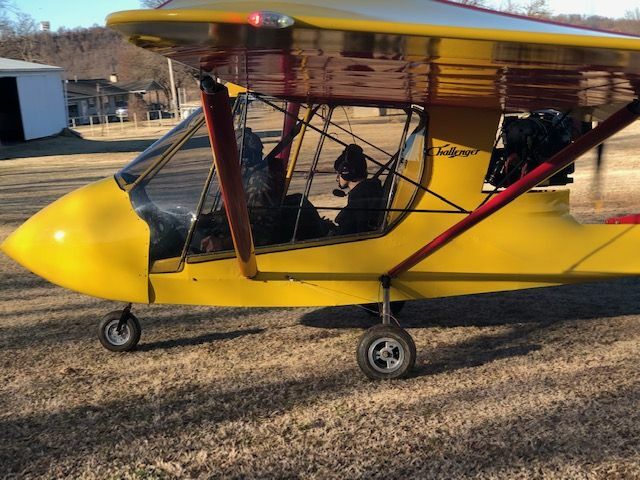 Two days later Glimp was in the air circling Eufaula Lake and surveying the surrounding area on his very first plane ride. Dunigan adds, "When he landed, he was so excited by the trip that he couldn't stop talking about how much it meant to him. What he did not realize was that our care team was already orchestrating a plan to grant his other two wishes." Liz Martin, Director of Business Development, contacted the Arkansas Missouri Railroad who graciously donated two round trip train tickets on the scenic route from Van Buren to Winslow. Shortly thereafter, Glimp and his lifelong best friend, Brian Ridenour, were able to ride the route and witness the beautiful Arkansas countryside while spending quality time together. Glimp's last and most treasured wish to speak with youth about the dangers of drug use was granted on Thursday morning with the help of Dunigan's coordination with the Future Charter School. Initially, Dunigan planned to transport Glimp to the school with the help of his care team, however, on the morning of his talk, Glimp felt too weak to make the trip. Determined to make his wish a reality, the care team quickly adapted their plans and arranged for Glimp to talk to the children via Facetime. The team traveled to the school and connected Glimp to the students via technology. Glimp was able to speak to the children about the dangers of drug use from the comfort of his own bed. Jon Hamby, Heart of Hospice Chaplain, also took the time to explain to the children what hospice was and why Glimp was on receiving care from Heart of Hospice. Martin shared, "At Heart of Hospice, we believe that true, quality care goes above what is required by Medicare and Medicaid. Everyday our incredible care team seeks out ways to transform lives in the communities we serve. Whether its through a simple act of kindness or a complex last wish, we treat our patients and their families as if they are a part of our own." Heart of Hospice currently serves approximately 1150 patients across 15 agencies in Arkansas, Louisiana, Mississippi, and Oklahoma; approximately 230 patients are served by the Fort Smith agency.